Crossville, Inc. recently debuted the Reformation porcelain tile collection as part of its exhibition at The International Surfaces Show in Las Vegas. Reformation is set to formally launch in mid-February 2019. 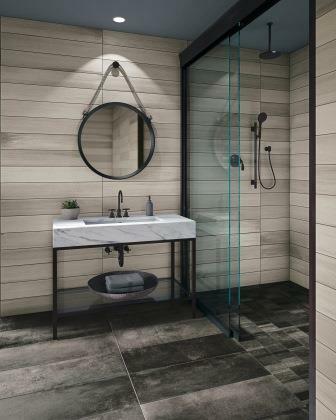 This unique, concrete-look product offers unprecedented visual depth with movement, pitting, aggregate, and sheen variations interpreted in stylish, large format plank tiles, as well as mosaic options and trims. “Though the color palette is neutral, the hues offer amazing visual texture,” Waldrep describes. Reformation comes in three rectified plank tile sizes—24”x36”, 12”x36”, and 6”x36”—that are ideal for mixing and matching in a variety of patterns. 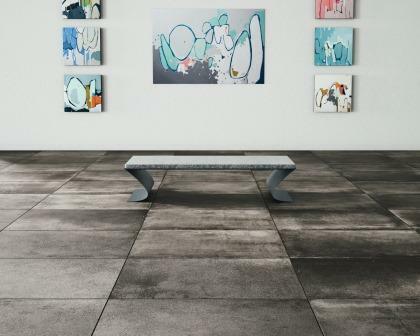 “The plank sizes combined with the concrete appearance is a unique twist, converging two industry trends into a new and unexpected look,” Waldrep shares. In addition to the plank field tiles, Crossville is introducing a new block mosaic for this collection. The line also comes with a standard 2”x2” square mosaic. These mosaic alternatives invite creativity and versatility while providing solutions with the technical characteristics required for wet-area flooring. Coordinating cove base and bullnose trims allow for fully finished looks. As with all products produced at Crossville’s Tennessee manufacturing facilities, Reformation is responsibly made in the USA, contains a minimum of 4% pre-consumer recycled content, and is Green Squared certified. Reformation is recommended for a wide range of interior installations, as well as exterior walls, in commercial and residential settings.